First of all, I loved all of your opinions and comments when I asked for help choosing the theme for the Michael’s Dream Christmas Tree Challenge 2013. When it came right down to it, I decided to take the advice many of you gave about challenging myself. After all, this is a Dream Tree CHALLENGE. So I decided to face a decorating fear of mine and go for “super elegant”. My fear with a super elegant theme is that I could totally mess it up and add elements that just don’t go. I wanted to steer clear of the gaudy look, but still have a tree chalk full of Christmas beauty. That being said I went a completely different way from my previous thinking and chose a Silver & Gold theme. The ornaments I chose are so glittery and perfectly elegant. They aren’t bold and bright or traditional, but they still make a gorgeous statement. I made a trip to Michaels Crafts, but this time to actually purchase the tree décor instead of wandering around wondering what theme I should choose. Once I spotted the Silver & Gold decorations, I was set on using it! I filled 2 carts with spools of ribbon, dainty silver and gold ornaments, glittery sprigs and 6 over-the-top gorgeous giant glittered reindeer (3 silver and 3 gold). With the trunk of my car full of beautiful sparkly awesomeness, I could barely contain my excitement as I drove home to start decorating. 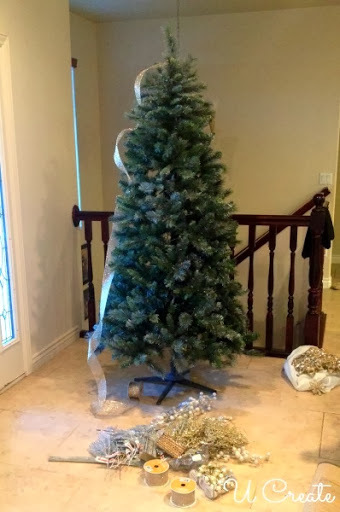 I laid out all my ornaments, ribbon, sprigs, and décor, set-up my most amazing tree and just stood there…sufficiently challenged! I had no idea how to even begin such an undertaking. I took a picture of all the loot I had scored and my naked Christmas Tree and sent it to Kari with the text “HELP!” hoping she would drive right over and show me how to create a Christmas tree that would wow you! 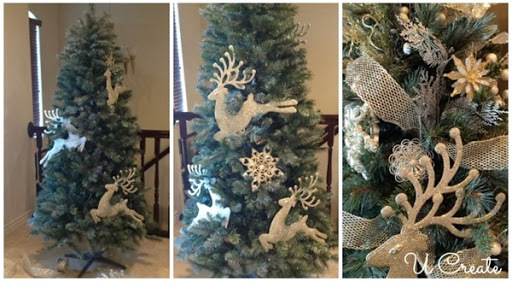 After all, she did create a gorgeous tree for the Michaels Challenge last year. Instead she sent a text back that said, “Start with the biggest ornaments and work your way down to the smallest ones.” Are you kidding me? That’s it?! I thought, “there is no way it is that easy!” Then I took her big sister advice and just started placing the biggest ornaments: the giant reindeer. Then I placed the big gold stars. Then the glittery balls, etc. Surprisingly, this was actually easier than I anticipated. After a couple of hours and lots of “stepping back to have a look,” I had all the ornaments in place. Now to fill in the holes; for this I used ribbon and the many sprigs I had purchased. Finally, I was finished and I plugged in the lights on the tree for the first time. I LOVE IT! 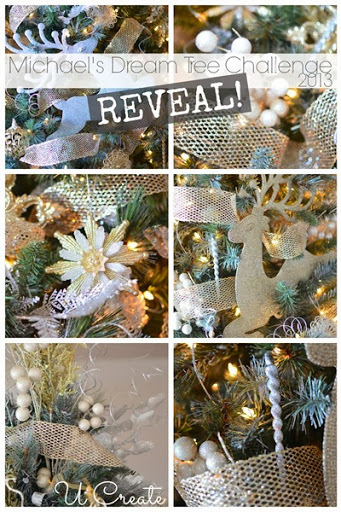 This Elegant Silver & Gold tree shines! It is truly my Dream Christmas Tree. I am so glad I accepted the challenge to go beyond what I would normally do and stretch myself. The results are far greater than I thought possible! Thanks to Michaels Crafts for providing the beautiful tree and gift card to purchase the ornaments. I had a fun time and am more than pleased with the results. I love it! You did a great job. I think with the white lights, it really plays up on the sparkly silver and gold. Becky your tree is GORGEOUS!!! I absolutely love the classic silver and gold theme! Breathtaking! The cost of the ornaments, ribbon, etc. cost about $400 with everything on sale. I love Michael’s sales! Love it! Those reindeer are so cool! Your tree turned out so great! I love the colors!! LOVE the silver and gold! Smart thinking ;)! Love the reindeer too! Turned out great! The silver and gold is such a great combo!! Love your tree! Turned out fabulous! Gorgeous! Love the shine and muted snow tones. IVe seen those reindeer at dollorama….cheaper than Michaels too.